Q: During a recent internal audit of claims where x-rays were being billed, it was brought to my attention that we were not using the appropriate modifiers since we use computed radiography (CR) x-ray machines. What are those modifiers and will using them affect my reimbursement? In order to track the usage of these x-ray technologies, CMS introduced modifier FX in 2017 to indicate an x-ray was taken using film, and modifier FY was introduced in 2018 to indicate an x-ray was taken using computed radiography. No modifier is required if an x-ray is taken using digital radiography. 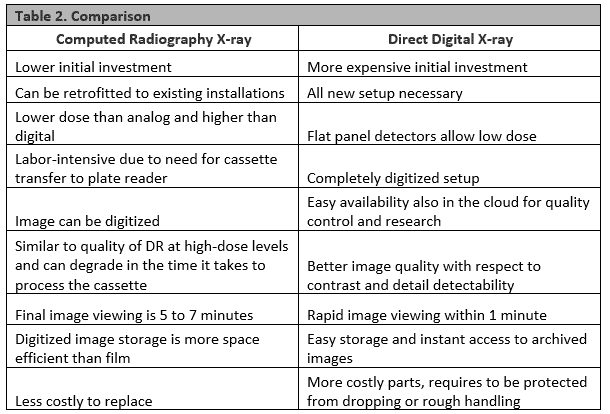 Computed radiography (CR) uses a cassette-based system like analog film to create a digital image, and is considered to be a bridge between classic radiography and digital radiography (DR). CMS rationalizes incentivizing the use of digital radiography as it is the latest advancement to the radiography field, has higher efficiency, and offers high-volume capabilities for larger or busier clinics. However, since both CR and DR both produce equivalent electronic images that can be easily stored and transmitted electronically, a skeptic might interpret the difference in payment between CR and DR could simply be seen as a cost-saving method for CMS. You will want to check with your regional and commercial payers to see if they are expecting these modifiers as well, especially for their Medicare products. For example, beginning in 2018, Blue Cross Blue Shield of Tennessee announced the requirement of the use of modifier -FY on all x-rays taken using CR, as well as the intention to impose the payment reduction rate introduced by Medicare on all of their Medicare Advantage plans. If your practice is using CR machines, what is the impact of the reimbursement cut on just chest x-rays? According to the Medicare Physician Fee Schedule (MPFS), the national average reimbursement for the technical component of a plain film radiograph is $20.90. CMS will impose a 7% rate cut, or approximately $1.46 per x-ray. The cuts could add up, depending on how many you perform in a day. A typical urgent care bills less than 200 x-rays to Medicare per year. At 200 x-rays billed to Medicare in one year, the annual loss in reimbursement for using CR would be approximately $344 currently and $490 by 2023. Is switching from CR to DR right for you at this time? You will want to consider the number of x-rays performed in your facility(ies), the staffing and space you have available, as well as the upfront cost when deciding whether to purchase different x-ray equipment. Each method offers its own attributes (Table 2). From a purely financial perspective, however, the above grid is a fairly pedantic exercise for urgent care centers. Even if the center’s actual loss is three times the estimated average loss at $1,500 per year, the high cost of transitioning to DR will not produce a return on investment within any reasonable timeframe. Thus, this change in reimbursement should not be the major factor in any decision to switch to DR.
Until you decide to upgrade from computed radiography, advise your billing team to add modifier –FY to x-ray codes that are taken using the computed radiography machines. Add modifier –FX for plain film x-rays for compliant coding and to avoid possible penalties. ← Suspected Pertussis in Infants and Adolescents—What to do?